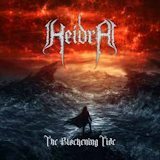 Heidra's latest album, The Blackening Tide, continues the band's often clean-vocalled Viking voyage. Fans of Wintersun and older Ensiferum will like the spot-on power/black metal mix, a cold sound that has just enough epic heartiness to balance out the black metal portions. It helps greatly that the band is capable of some thunderous speed and precision. Lady of the Shade's galloping melodies are vaguely neoclassical, reminding me a bit of Winterlong in places. The more "traditional" pieces in the style of Ensiferum are nicely made as well, though, with the band's twin guitars underscoring Morten Bryld's bombastic clean vocals. Giving their sound depth is an army-size female choir and some symphonic stylings, though they use the latter sparingly. The blackened vocals aren't as distinctive as the clean ones, but support the faster songs; on the slower songs, this doesn't work as well, and the tradeoff between harsh and clean vocals doesn't seem as though it lends as much inspiration to the overall song as the band wishes. Where Heidra succeeds is in the atmosphere. They can make rousing Viking songs for sure; the songs are not quite as over-the-top as Jari Mäenpää could make back when he was making good music, but there's certainly a good dollop of that in there. The band's technical skill burnishes an already quite good Viking metal album with melodic notes, making it worth checking out.